Ever since our sessions during the Edinburgh Festival (as detailed in the last post) we’ve continued to have people visit the studio for various voice recordings. As such we thought it was time to invest in a brand new microphone! The world of mics can be a disorientating one – there are so many to choose from and each is suited to a different purpose. 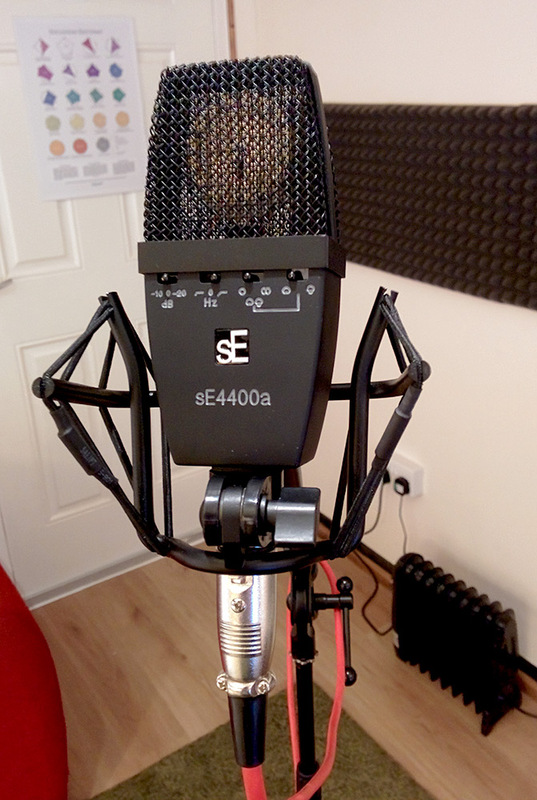 Given the open-ended remit of The Noisefloor but bearing in mind the increased number of voice recordings we’ve been doing, we settled on the Se Electronics 4400a – a great all-rounder, but a mic particularly suited to voices, both sung and spoken. With the new mic installed we conducted some recording experiments. 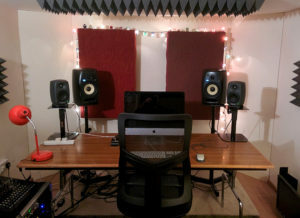 As you probably know, the noise floor of a space, as well as being the studio’s namesake, is the level of ambient noise that remains when everything else is silent. Short of building an anechoic chamber it’s impossible to get a completely silent room, but we’re pleased to say The Noisefloor’s noise floor (there’s a mouthful) hovers around -64dB for recordings with around -3dB peaks and gives a good, clean final result. The se4400a also comes with 2 bass roll-off settings to further enhance recordings. Regular users will be pleased to hear (quite literally) that we’ve invested in some new stands for the Genelec 8020 monitor speakers. The difference in sound is incredible as the Genelecs are now positioned at optimum listening height/position, with effective vibration absorption. 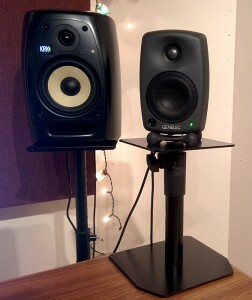 Switching between the KRKs and the Genelecs is extremely useful when mixing your music as both speakers have slightly different characteristics. The Genelecs are flatter, with less low end (although still a surprising amount for their size) and incredibly clean mid/highs. The KRKs go lower (and lower still if you have the sub on), sound slightly warmer and have a pronounced high end. In the very near future we will be plumbing in our new patch bay. This will mean the RME Fireface inputs that are hidden round the back will be accessible and make routing all the easier. We have some basic hardware ready to go (a Zoom 9120 Digital Effects Processor and a Behringer Ultra-curve Pro DSP8024) and will eventually be investing in more outboard gear. If you have any suggestions for what you’d like to see in the studio, drop us a line.